Sometimes when a thing proves difficult to do or is in the end totally unattainable you yearn for it even more. 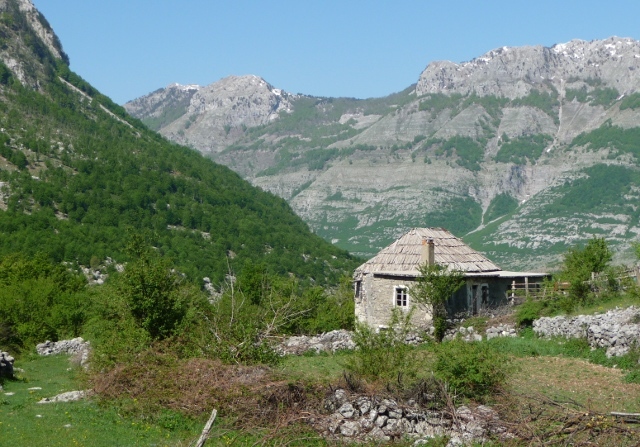 So it was with Thethi, reputedly one of the most scenic of Albania’s remote settlements set in a deep valley surrounded by the tall mountains known as the Accursed Mountains or Albanian Alps. 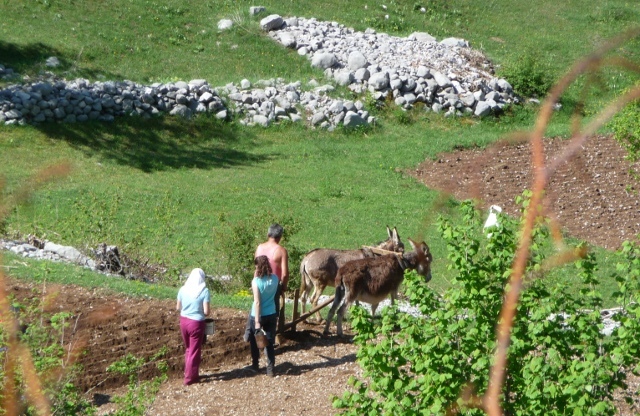 Northern Albania has the reputation for upholding traditional life, but is also seen as remote and rather backward compared to other regions of the country. You see a few people in national dress and age-old farming methods are still in use. It also upholds the strict moral codes laid down by Lekë Dukagjin, a clan chief back in the 15th century. These codes govern much of life, including marriage and property. They also govern the system of honour bound revenge killing, or blood feuds. These only affect male members of a family and where someone was at risk of being killed, they would hide in a ‘lock-in tower’ for months until an agreement was made to call off the feud. Apparently the feuds were suppressed under Communism, and most of the lock-in towers demolished. Following its fall and the chaos that followed, the tradition revived again and is in existence today in this region. In Thethi, one can see one of the only original lock-in towers still standing, which can only add to the intrigue and fascination of the area. 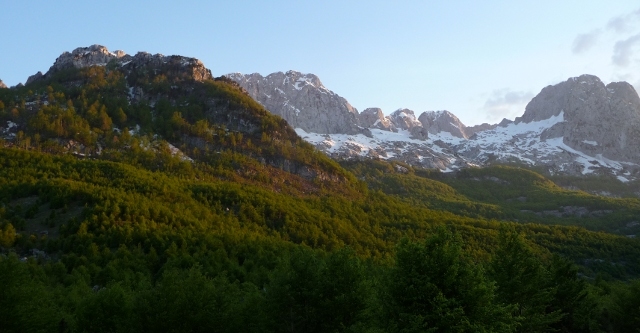 After making the Komani Ferry trip – this was just about the last elusive bit of Albania to see. Although a resort in summer, Thethi is rather difficult to access. The only viable road there was variously reported as possible by a two-wheel drive vehicle or only possible with a 4×4. It was hard to find answers, so like the Komani Ferry, we decided to drive up there to see for ourselves. 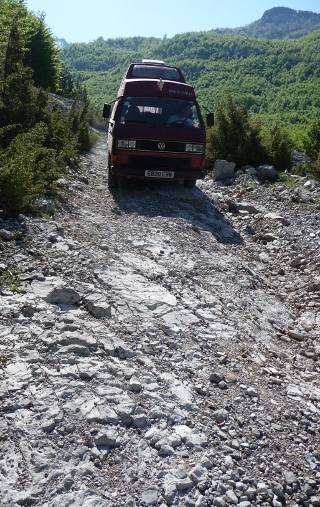 The main road out of Shkodra started easily enough but there was a lot of intermittent roadworks going on between the town and the Montenegrin border at Hani-i-Hotit. Brand new stretches interspersed with rough dusty bits, on and off the new bit of road, in and out of villages. The turning leading up the valley towards the mountain pass for Thethi is off this road. Somewhere. We were almost to the border without spotting it though and of course there were no signs. We doubled back and did eventually spot a road which could only be the one. 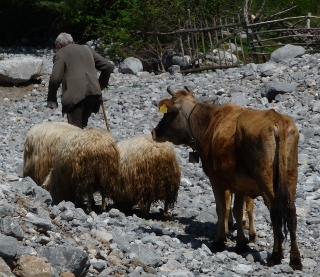 A narrow but reasonably good tarmac road leads slowly up the dry-river bed valley past small farms and hamlets, the mountains rising on either side, until the tarmac abruptly ceases and it becomes a very stony road indeed just as you enter the village of Bogë. The village is scattered below the mountains and didn’t seem to have a focal point. We drew to a halt beside a café perched on the first floor of an unfinished house, but we were collared by a man who insisted we take our beverage in his garden, which turned out to be another café, of sorts. His pretty, but toothless grown up daughter then brought two beers on a doilied tray. Everyone there was in agreement however, the road to Thethi was closed. A firm hand gesture. Snow. 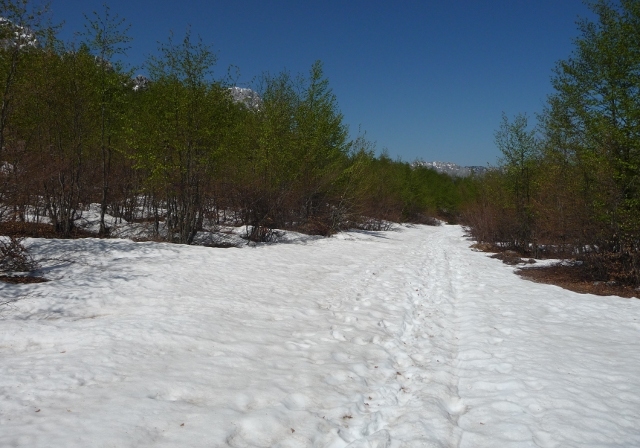 In mid-May, Thethi is still snowed in. In spite of such hot weather. It was ok though, they were happy for us to camp in their garden if we wanted. Sad but resigned to missing out on Thethi, we decided to see how far up the road we could go, and set off rattling and bumping along the track out of the village. Sometimes relatively smooth, sometimes lumpy with large stones, the rocky surface below emerged at times. 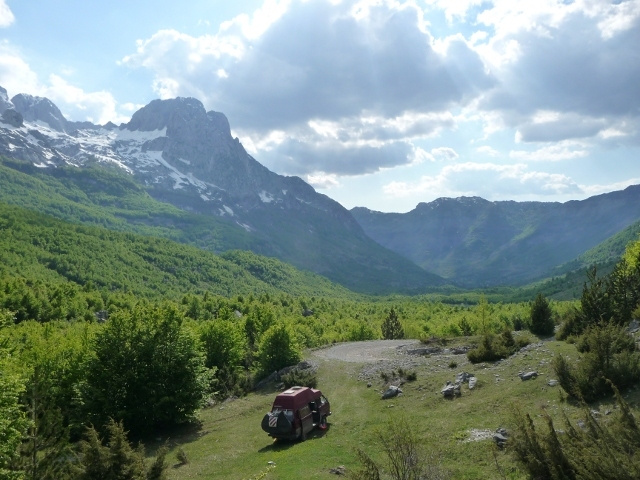 The van coped exceedingly well and we passed more farms and stony meadows as we climbed slowly up the valley towards the jaggedy snowy peaks above us. We spotted several possible wild camp spots along the way, and it was after a particularly tortuous rise, just as the road started to seriously climb that we drew to a halt off the road in a grassy hollow. This was about as far as we should risk taking the van and with our ramps we could almost make the van level. Another wonderful alpine camping place. Mountains all around, only natural sounds, stunning beauty. Thethi might be glorious, but this was also close to perfection. We relaxed and absorbed the views, enjoyed our dinner outside, until the sun dropped behind the distant ridge and the air grew chilly and drove us inside. Next morning we woke early and not having much of a plan, we decided to walk up the hill to see if we could get to where it was blocked. The road up was surprisingly gentle with its gradual gradients, and lack of really rough bits. It wound through beech groves, with their soft spring attire. The van grew tiny far below us and the views ever more dramatic. After a couple of hours of climbing, we reached the first snow, which although not that deep, spread across the road, it didn’t look as though a vehicle had passed through recently although some may have attempted it. 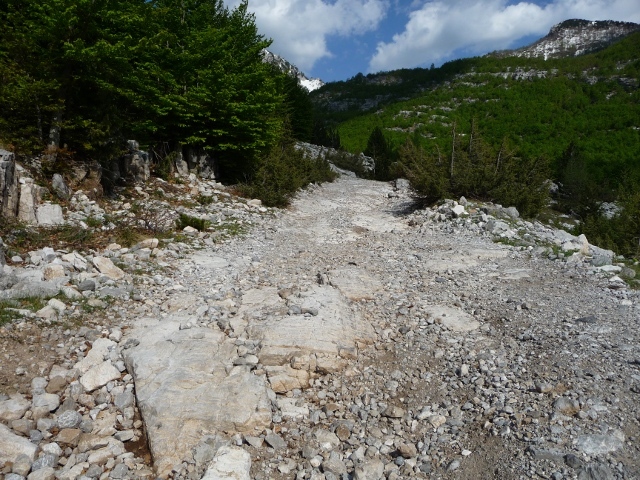 We skirted it, continued round a couple more hairpins, and there was the real blockage – a lot of snow as far up the track as we could see, and this was a patch where it was levelling out. We considered walking further on, but it would be at least 10km on to Thethi and we didn’t have food with us having only planned a simple stroll. We could have brought the van up here quite easily, but we could never have got through the snow. Unfortunately we don’t have time to wait until it melts. A few days more? A couple of weeks? Judging by the footprints, people have been walking through the snow – perhaps getting taxi rides at either end. We reluctantly turned and walked back down to our hollow. It was so lovely and peaceful, we decided to stay another night. The place was alive with insect life – butterflies and huge flying beetles with gleaming gold green bodies, bees and bugs of all sorts. 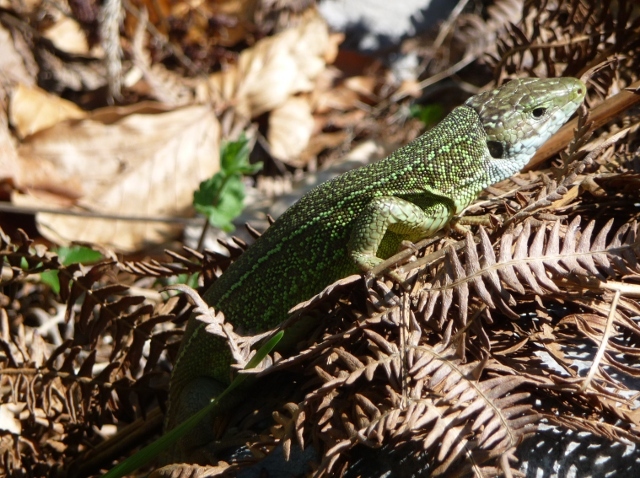 We also saw lizards, including the rather spectacular creature below. Quite a few cars went up and then came back down, at least one every couple of hours. Two Belgians pulled in for a chat – they had tried but failed to make it over the pass. One of the guys had been to Thethi before – it’s a wonderful place, he said. Then there was the mystery of the ones who went up and stayed up or came down without having gone up. Perhaps there was another mystery road through the mountains, or perhaps there were a couple of houses hidden away up there in the forests. It was a slow careful trundle down to the village again the next morning. We’d come up further than we realised, and even downhill the road was tough in places and rocks twanged the underside of the van alarmingly. We may not have made it to Thethi, but we’d come as close as we could and it would be hard to beat the natural surroundings we’d spent two nights in. 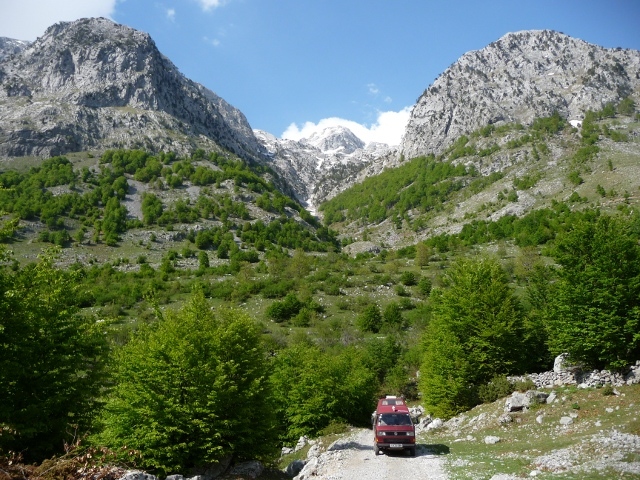 This entry was posted in By Country - Albania, Personal stuff, Travel stuff, Van stuff, Wildlife stuff. Bookmark the permalink.